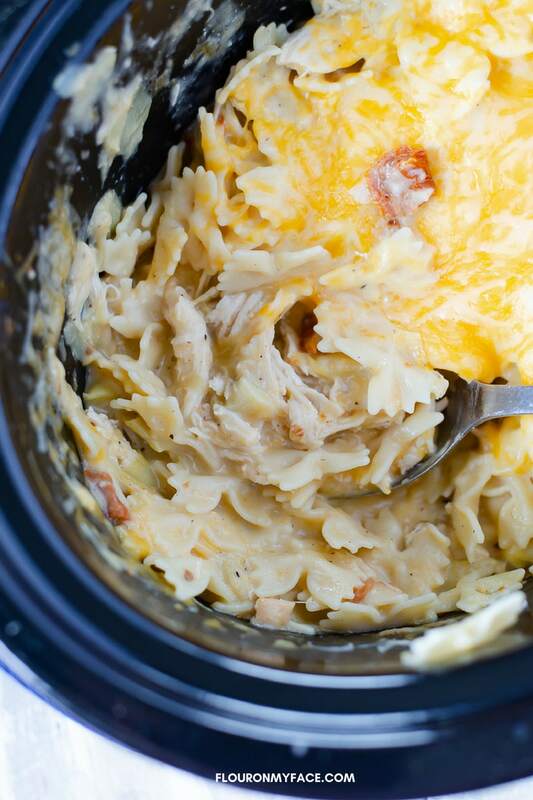 This Cheesy Crock Pot Chicken Artichoke Casserole is creamy, cheesy and delicious. I love to sneak some artichoke into my crock pot recipes. It is an easy way to introduce a new vegetable to the family. Crock Pot casseroles are so easy to make. What I love about this Crock Pot Chicken Artichoke Casserole recipe is I get to enjoy one of my favorite vegetables. Using canned artichokes makes it easy. And the flavor combination of the chicken, artichokes, sun-dried tomatoes with the cheesy sauce is delicious. 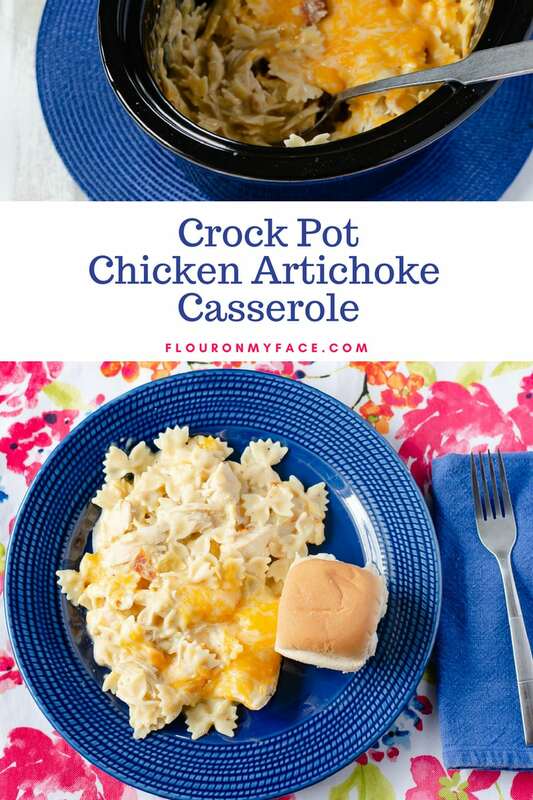 I used mini bow tie pasta for this Crock Pot Chicken Artichoke Casserole recipe but you could use just about any shape of boxed pasta you have on hand. 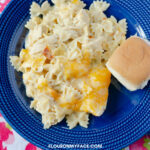 You could even use spaghetti noodles to make this crock pot chicken casserole recipe. Place the boneless chicken breasts into a 6-quart crock pot. Salt and pepper both sides of the chicken. Add the roasted tomatoes and quartered artichoke hearts to the crock pot. In a small bowl whisk the cream of chicken soup and milk together until lump free. Add 1 cup of shredded cheese to the bowl and mix to combine. Pour the cream of soup mixture over the chicken in the crock pot. Using a fork move the chicken around so the soup sinks below the chicken breast pieces. Place the lid on the crock pot and cook for 2 to 3 hours on high or 4 to 5 hours on low or until the chicken is cooked to an internal temperature of 165 F. degrees. Cooking times will vary depending on the thickness of the chicken breast pieces use. Once the chicken is done cooking use a fork to pull the chicken into bite-size pieces then add the cooked pasta to the crock pot. Mix well so the pasta is covered with the sauce. 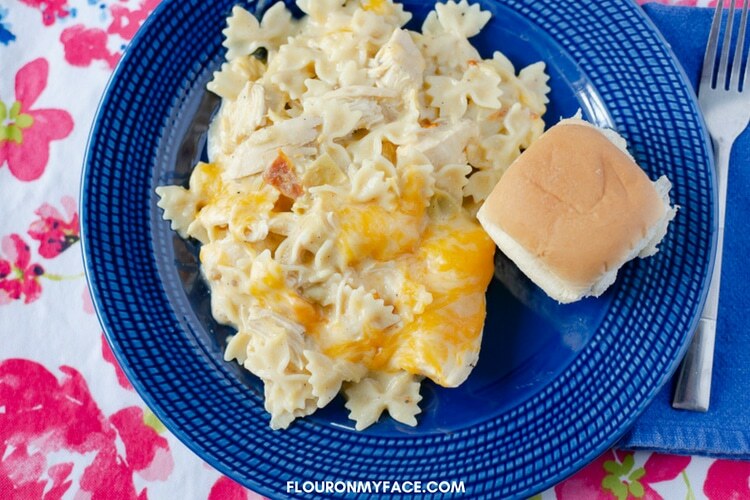 Sprinkle the remaining shredded cheese over the top of the pasta and chicken. Place the lid on and turn off the crock pot or turn it to the warm setting if available. Allow the cheese to melt before serving. What I love about this Crock Pot Chicken Artichoke Casserole recipe is I get to enjoy one of my favorite vegetables. 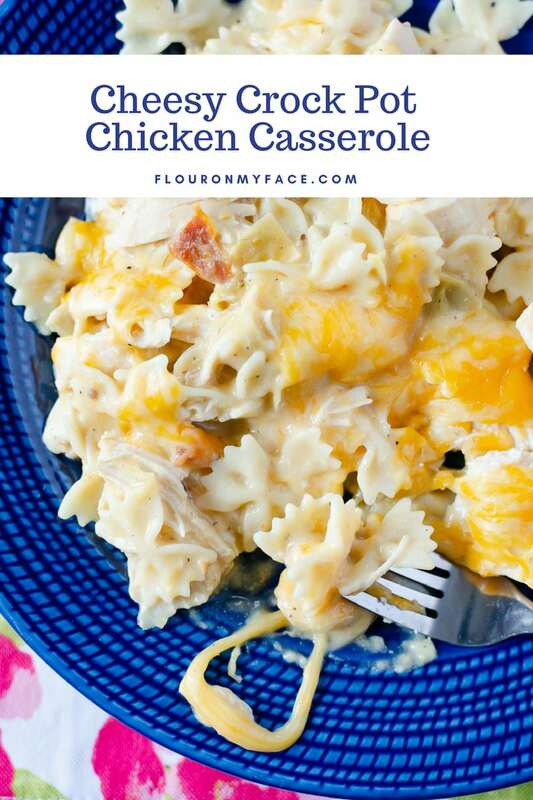 If you love Crock Pot recipes check out the Flour On My Face Crock Pot recipe page. 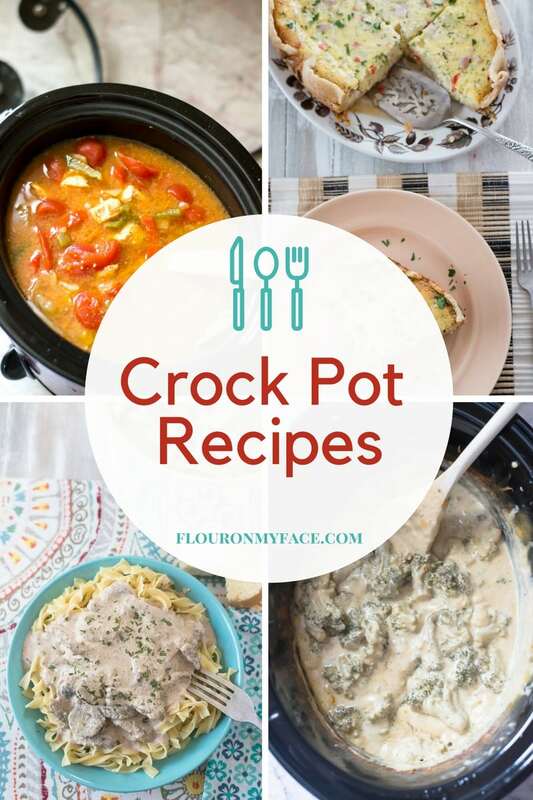 There are over 200 crock pot recipes to pick and choose from.